This is the third year in a row they have focused on smoke alarms, but for good reason. If your smoke alarms are not maintained or working properly, there is an increased risk in the event of a home fire. 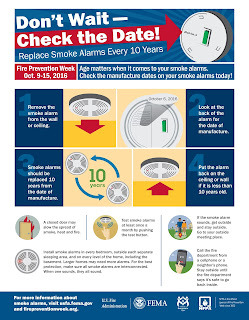 Please keep in mind that smoke alarms should be replaced every 10 years. Stay safe! Make sure you know how old all the smoke alarms are in your home.